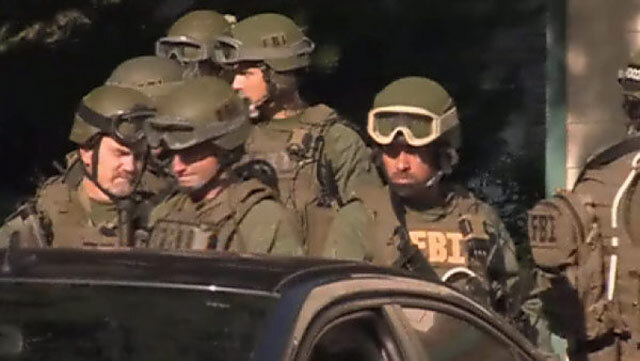 FBI agents in heavy-duty battle gear during July 25 raids on anarchist activists in Portland, Oregon. PORTLAND, OR – On July 25 of last year, several homes of activists in the Pacific Northwest were broken into by federal agents who claimed to be seeking evidence for a grand jury investigation. The “crime” being investigated was alleged vandalism of a federal building during May Day demonstrations in Seattle. However, the warrants specifically mentioned “black clothing” and “anti-government or anarchist literature” as items to be seized. The “investigation” was really a fishing expedition designed to force activists to turn over information on their friends and fellow activists under parameters that are so vague that just about anyone ever associated with any of those targeted could be named as a suspect. In addition to issuing the search warrants, which included as “evidence” political and union literature, the grand jury proceeding seeks to compel witnesses to testify and inform on their associates. Those who refused to testify were jailed while the grand jury proceeds, and could face federal charges that could result in lengthy prison sentences. Three of those targeted in the raids – Matthew Duran, Katherine “Kteeo” Olejnik and Maddy Pfeiffer – heroically refused to testify and were held in the Sea-Tac Federal Detention Center for months. Duran and Olejnik were released on March 7 but Pfeiffer remains in prison. We join unionists and defenders of democratic rights in demanding that Maddy Pfeiffer be released and any proceedings against anyone targeted in this dragnet be dropped and their records expunged. The federal government of Barack Obama which launched this attack on political dissenters should be held liable for millions of dollars in monetary damages for its wanton abuse of the activists’ rights. 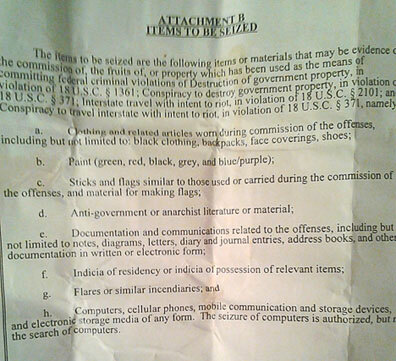 Search warrant for July 25 FBI raids in Portland lists “anti-government or anarchist literature or material” as items to be seized. The grand jury resisters were held for over two months in solitary confinement, causing a deterioration of their health. Although they were being held as witnesses and the purpose of the imprisonment was to coerce testimony, federal district judge Richard Jones noted “their resolve appears to increase as their confinement continues.” In ordering release of Duran and Olejnik, the judge ruled that their continued imprisonment was “purely punitive,” yet they had not been charged with criminal contempt (or anything else), and therefore their right to due process was being violated. In Portland, three homes were broken into, and three activists detained. Although local police claim that they weren’t involved in the searches, a recent reversal of the 2005 decision to become independent from the federal Joint Terrorism Task Force (JTTF) make it unlikely that local authorities were unaware of the investigation. The city of Portland has a long and tortured history of espionage against activists ranging from Quaker peace activists to the Black Panther Party. The notoriously corrupt Portland Red Squad has often sought to intimidate and harass activists participating in a variety of organizing efforts. With this history in mind, beginning in the late 1990s several unions and community organizations initiated a struggle to end the city of Portland’s relationship to the JTTF. Finally, in 2005 they won a city council decision making Portland the first (and only) city to pull out of the task force. As a result, for several years city police were not supposed to participate directly in FBI “anti-terrorist” investigations. However, the decision was reversed in 2011, and particularly during the Occupy movement that fall and subsequently, local police are evidently working closely with the feds, no matter how flimsy the pretext for the “investigation.” By July 2012, this included targeting activists based on their alleged association with Mayday activities in Seattle. Sweeping through homes under the pretense of looking for evidence in a petty vandalism case is a blatant witch hunt designed to intimidate activists. Citing political and union literature as evidence of any kind is persecuting people for thought crimes. Anarchists were the immediate target, but any group considered to be revolutionary by the federal authorities could be next. Under the old Wobbly watchword, carried forward by the ILWU, that “an injury to one is an injury to all,” supporters of the Internationalist Group in Portland-area unions circulated a resolution calling on labor organizations to denounce the July 25 FBI raids and defend those targeted. The resolution (printed below) was endorsed by the Industrial Workers of the World, Portland Local; International Union of Painters and Allied Trades Local 10; International Alliance of Theatrical Stage Employees Local 28, International Longshore and Warehouse Union Local 5 and Laborers International Union of North America Local 483. Resolved that we call for a meeting of union members to discuss next steps in resisting FBI repression and form a network to respond to any future raids.